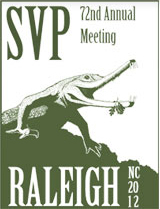 The Society of Vertebrate Paleontology (SVP) will hold its 72nd annual meeting in Raleigh, NC in October. Everyone loves dinosaurs, so if past experience is any indication, there will be plenty of press coverage of the meeting. SVP Abstracts are reviewed by the Program Committee and occasionally by outside reviewers. Authors are responsible for the technical content of their articles. Unless specified otherwise, coverage of abstracts presented orally at the Annual Meeting is strictly prohibited until the start time of the presentation, and coverage of poster presentations is prohibited until the relevant poster session opens for viewing. As defined here, “coverage” includes all types of electronic and print media; this includes blogging, tweeting and other intent to communicate or disseminate results or discussion presented at the SVP Annual Meeting. Content that may be pre-published online in advance of print publication is also subject to the SVP embargo policy. Still photography, video and/or audio taping or any other electronic recording at the SVP Annual Meeting is strictly prohibited, with the exception of the designated SVP press event. The SVP reserves the right to engage professional photographers or audio/videotape professionals to archive sections of the meeting for the Society’s use. Editorial policies of Science and Nature magazines: If you are planning to submit, or have submitted, your publication to Science or Nature, be sure you are familiar with their embargo policies. Please address any questions about program practices to the Program Committee or to the Executive Committee. Content that may be pre-published online in advance of print publication is also subject to the SVP embargo policy. To the SVP press registrant who flagged this for me — and to me — this sounded a lot like “freely available but embargoed.” A number of journals have tried embargoing studies published online ahead of print, but many have seen the errors of their ways. Some haven’t. This statement is not referring to something that we have already published (which, as you note, would be impossible for us to embargo), but rather is directed at stories that might be published by a paper or other journalistic entity that has both print and on line versions. It is saying that both version of the same story must abide by our embargo. For instance, if material presented at our meeting is embargoed until noon on August 1st, is it not permissible to publish a story about it online on July 31st even if the print version of the same article will not appear until the evening edition of the August 1st paper. I hope that answers your question. I see what you mean now. It’s a bit confusing, and other societies have tried to enforce embargoes like that on their own material. A press registrant flagged this for me, so it may be worth clarifying to those registering. Thank you for pointing that out. That is a good suggestion. I will work on stating it more clearly to avoid confusion! I’m very glad you’ve shined a light on this one, here at such a popular blog, but tbh I don’t think you went far enough with your questions or your critical examination of the embargo policy – it’s not just press that have issues with it – it’s researchers too! Perhaps you could write a follow-up from that perspective? This sort of thing may be unusual in paleontology, but many biomedical science conferences have similar policies: https://embargowatch.wordpress.com/?s=conferences Certainly it would be best if scientists were free to talk about their work whenever they wanted, but many agree to these terms because presenting at conferences is important.The same is true for publishing in journals, where a related issue, the specter of the Ingelfinger Rule, can have an effect. Let me know what you hear from SVP.